Legacy giving does not require a large income or vast estate. Legacy giving only requires a thoughtful intention to make a difference by identifying the Masonic Home of Missouri in your will or estate plan. Estate gifts received in Fiscal Year 2018 totaled over $445,000, providing support for individuals in need statewide. Those who remember the Masonic Home of Missouri through a will, trust, beneficiary designation, or other planned gift are invited to join this society. Often these gifts go unrecognized because we are unaware of them until the donor has passed away. At these times, proper appreciation cannot be expressed and questions regarding the specific purpose of the gift may remain unanswered. The Legacy Society provides a way to recognize and thank donors during their lifetime(s) and ensure that their wishes are properly documented. You may always choose to remain anonymous in your philanthropy. However, participation in The Legacy Society can be an inspirational experience, and may encourage others to look toward the future and how they too may have an enduring impact on the causes about which they are most passionate. 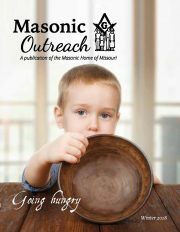 A relationship with the Masonic Home of Missouri and other donors during your lifetime. Assistance in wording your legacy gift to ensure your wishes are carried out. Special recognition in publications as desired. Permanent recognition on The Legacy Society Tree loca­ted at the Masonic Complex. Potential reduction in tax burden. Satisfaction in knowing your legacy will make a difference. How Can I join The Legacy Society? If you have already included the Masonic Home of Missouri in your will or other planned gift, please let us know so that we may honor you as a member of The Legacy Society. Legacy Society members share a dedication to the Masonic Home of Missouri — but every act of giving is personal and unique. Contact our Major Gifts Officer at 800-434-9804 to discuss your preferences. Disclaimer: The Masonic Home does not provide tax, legal, or other professional advice. For assistance in planning charitable gifts with tax and other implications, the services of appropriate advisors should be consulted. I’m supporting the Masonic Home in my Estate because of the fellowship and brotherhood that the Masonic Lodge has given me. There are Brothers in need that can use our help. It’s a pleasure to do it.